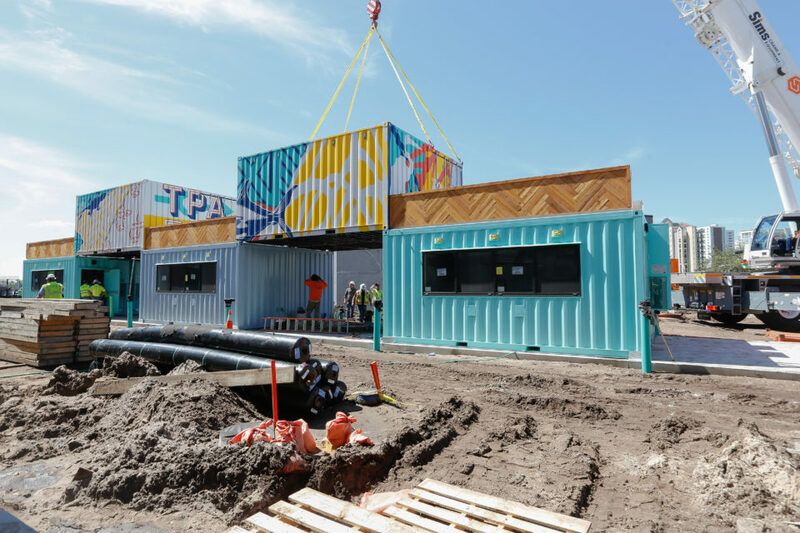 If you’ve seen our work with Sparkman Wharf, you’ve already seen the incredible impact that shipping containers can have on a real estate developer’s portfolio. Not only are these structures delivered faster than traditional construction methods and built to be mobile, but they also help you add and build value in your portfolio. We propose that shipping containers can add value to your holdings in three ways. First, brokers can increase their occupancy, second brokers can increase their rental rates, and three shipping containers can help brokers reduce their operating expenses. Modified shipping containers are self-contained commercial buildings. The box is equipped with the mechanical elements and electrical wiring that allow them “plug-and-play” with municipality utilities or generators. So, developers could build a foundation with hook-ups or brokers could place them on non-performing assets and undeveloped land parcels to monetize them through short-term pop-ups or longer-term leases. Shipping containers increase a property’s occupancy because they allow you lease out space that otherwise, wouldn’t generate revenue. Shipping containers are seen as a premium activation site for trendy pop-ups, guide shops, and tech-enabled brands with minimal footprints. When they’re included in the build plans for new or underperforming properties, they have the ability to attract and contribute to the revitalization of struggling areas. When the quality and quantity of traffic increases, so does demand. The change isn’t immediate, but it is impactful. Shipping containers are typically used for spaces with a small footprint. Although they can be stacked or joined to create larger volumes of space, their most common construction use is micro retail and smaller restaurants and kitchens. This means two things for proprietors, there’s less volume of space to heat and cool saving a fortune on utilities and only about three employees fit comfortably in the 100-500 square foot space, saving you on labor rates. Aside from the dollars you can save because the spaces is smaller, there are also significant tax benefits for using containers as semi-permanent or permanent construction. By utilizing Boxman Studios’ product, our clients can receive tax benefits. Based on IRS Publication 946, container structures are categorized as 7-year tax life property. Specifically, the code states, “Any property that does not have a class life and has not been designated by law as being in any other class.” This means that modular units are not called out in the IRS Publication 946, therefore it defaults to a 7-year property, which allows you to depreciate the units over a 7-year tax life. Commercial traditional stick-built construction in IRS Publication 4562 is classified as nonresidential real property, which has a depreciation period of 39 years.